The 2018 BMW X5 M high-performance luxury crossover is breathtakingly fast and amazingly capable. 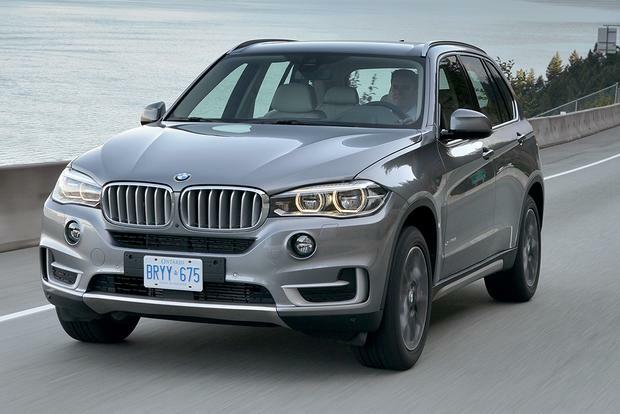 The 2018 BMW X5 continues its highly successful run as a prime premium midsize crossover. 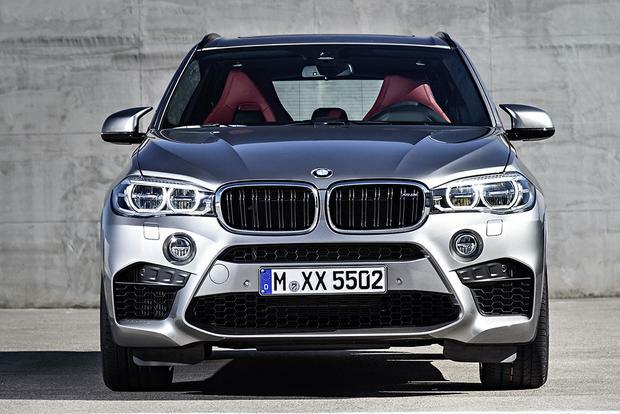 2016 Porsche Cayenne vs. 2016 BMW X5: Which Is Better? We're comparing two of today's top luxury SUVs, the Porsche Cayenne and the BMW X5, to find out which is better. 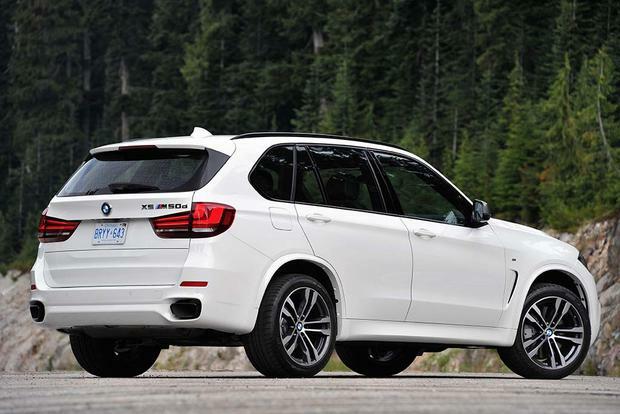 The all-new 2015 BMW X5 M pairs serious versatility and luxury with a gonzo 567-hp twin-turbo V8. It's an awesome SUV for the right buyer. The 2016 BMW X5 stays on the course of being one of the best premium crossovers in the business and adds the xDrive40e plug-in hybrid. If you're looking for an edgy luxury crossover that really pushes the envelope, we'll be honest: You probably won't go gaga for the 2015 BMW X5. 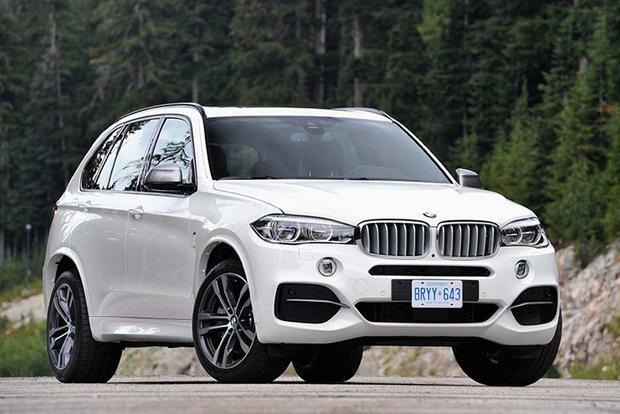 Although the X5 received a clean-sheet redesign last year, the result reminds us a lot of the previous model. You've still got three options under the hood: a gasoline inline-6, a diesel inline-6 and a twin-turbo V8. The styling remains conservative. Let's not forget the X5's radical roots. This is the vehicle that almost single-handedly invented the concept of a high-performance crossover SUV. Fifteen years ago, the original X5 burst onto the scene as a 5 Series on stilts, keeping pace with sport sedans while its rivals plodded behind. Today, two generations later, you can still feel the X5's revolutionary spirit in its athletic, carlike responses on the road. Throw in ample doses of luxury and refinement, not to mention a revamped diesel engine that returns an incredible 31 miles per gallon, and you've got a nearly faultless vehicle. 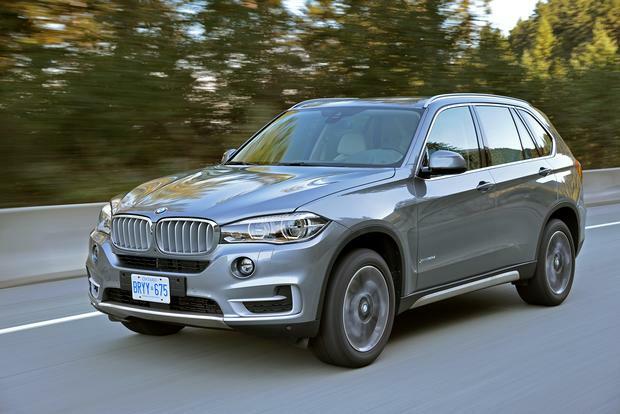 It may not be edgy, but the 2015 BMW X5 remains the gold standard among premium crossovers with a pulse. 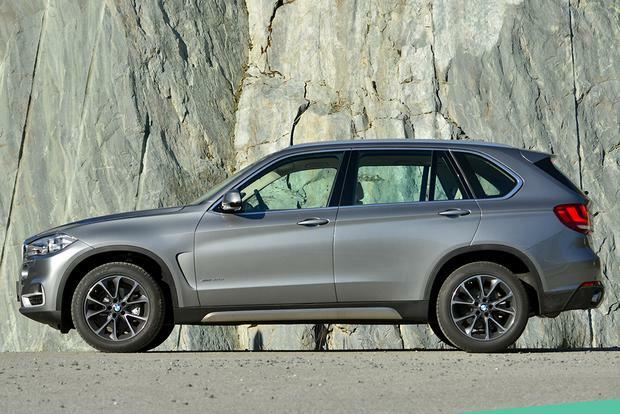 Following a full redesign last year, the X5 is essentially unchanged. The rear-wheel-drive sDrive35i and all-wheel-drive xDrive35i feature a turbocharged 3.0-liter inline-6 engine rated at 300 horsepower and 300 lb-ft of torque. Fuel economy for the sDrive35i is rated at a solid 19 mpg in the city and 27 mpg on the highway, while the xDrive35i is virtually the same at 18 mpg city/27 mpg hwy. The all-wheel-drive xDrive35d employs a diesel-powered turbocharged 3.0-liter inline-6 that generates 255 hp and 413 lb-ft. Fuel economy is remarkable for a 5,000-pound crossover: 24 mpg city/31 mpg hwy. The all-wheel-drive xDrive50i steps up with a twin-turbocharged 4.8-liter V8 that cranks out an absurd 445 hp and 480 lb-ft. Fuel economy plummets, predictably, to 15 mpg city/22 mpg hwy. The 2015 X5 is available in four trim levels: sDrive35i (the "s" signifies rear-wheel drive), xDrive35i, xDrive35d and xDrive50i. The sDrive35i ($54,150) comes standard with 18-inch alloy wheels, adaptive xenon headlights, LED fog lights, a roof spoiler, a power tailgate, auto-dimming mirrors, a universal garage door opener, a power-adjustable steering wheel, leatherette upholstery, 10-way power front seats with driver memory functions, dual-zone automatic climate control, iPod/USB and Bluetooth connectivity, a 9-speaker audio system (including two subwoofers) and the iDrive infotainment system with navigation, 20 gigabytes of audio storage and a 10.2-in high-resolution screen. The xDrive35i ($56,450) adds all-wheel drive, hill descent control and eligibility for the Dynamic Handling package, which includes adaptive dampers, active roll resistance and a rear air suspension. The xDrive35d ($57,950) adds the diesel engine but is otherwise equipped similarly to the xDrive35i. The xDrive50i ($70,050) upgrades to the twin-turbo V8 and adds 19-in wheels, chrome exterior accents, metallic paint, keyless entry and ignition, 20-way multicontour front seats, leather upholstery and a rearview camera. Most of the xDrive50i's standard extras are offered on lesser models as options. Notable add-on bundles include the Cold Weather package (heated steering wheel, heated rear seats and headlight washers), the Lighting package (LED adaptive headlights with automatic high beams) and the Driver Assistance Plus package (see Safety below). Available exclusively on the xDrive50i is the Executive package (power-closing doors, a leather dashboard, rear sunshades, ceramic controls, head-up display, quad-zone climate control and 16-speaker Harman Kardon sound), though many of its contents can be added to the other models a la carte or as part of lesser packages. Other options include 20-in wheels, Nappa leather upholstery, adjustable second-row seats, a top-of-the-line Bang & Olufsen audio system (with a motorized center speaker that rises to the occasion) and a rear-seat entertainment system with twin 9.2-in monitors, adaptive cruise control and a third-row seat (which comes with the rear air suspension). There are also three trim-package lines to choose from: the Luxury Line, xLine and M Sport, with distinctive aesthetics and numerous customization possibilities. Cargo space in the X5 measures 23 cu ft. behind the second-row seats and 66 cu ft. with the rear seatbacks folded down. That's less room than most midsize crossovers provide (and not much more than you'll find in BMW's X3 compact crossover). 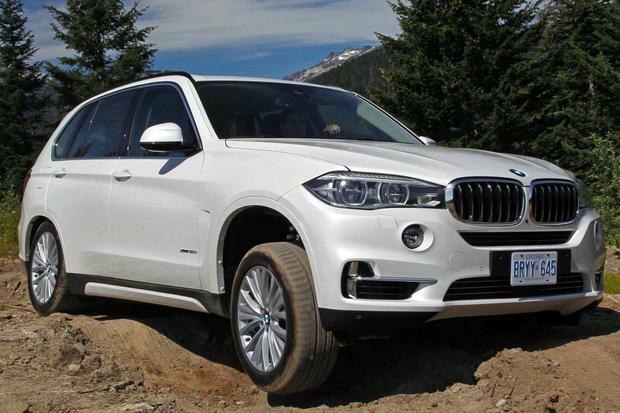 The X5 comes with standard stability control, 4-wheel anti-lock disc brakes and six airbags (front, front-side and full-length side-curtain). The standard BMW Assist telematics system provides automatic crash notification, emergency assistance and more. The optional Driver Assistance Plus package adds blind spot monitoring, lane-departure warning, a collision-mitigation system with full auto-stop capability, a driver drowsiness monitor and a 360-degree safety camera system. Also offered is an infrared night-vision system with pedestrian detection. In our interior evaluation of the 2015 X5, we noted tight seams on the dashboard and consistently high materials quality from one side to the other. The wood trim that bisects the dash curves gracefully toward the passenger-side A-pillar, while the beautiful 10.2-in iDrive display lives in an iPad-like housing that protrudes above the center stack. 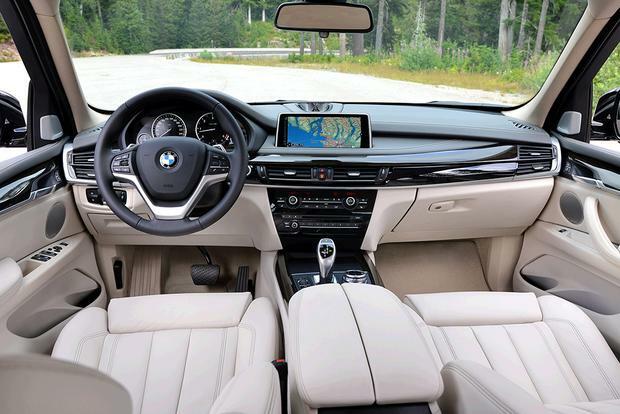 The iDrive system additionally boasts BMW's latest rotary controller with touchpad functionality, bolstering its credentials as a genuinely user-friendly interface. The X5's supportive standard front seats will displease no one. As usual, though, we're strong advocates of the available multicontour seats. Blessed with seemingly infinite adjustments and an uncanny combination of firmness and compliance, the 20-way multis are among the best seats in any vehicle. We also like the optional adjustable second-row seats, though sadly, they can't be combined with the third-row seat. As for that third row, it's nice that BMW continues to offer it, but most adults will likely find it cramped and uncomfortable. 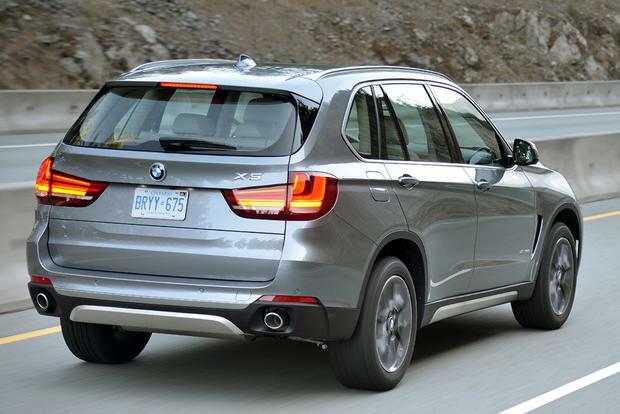 The X5 is more of a 5+2, if you will, than an honest 7-passenger crossover. Under the hood, the 35i models' familiar 3.0-liter turbo inline-6 serves up smooth, strong acceleration, while the 8-speed automatic rips off rapid yet seamless shifts. Truth be told, this powertrain is all most folks will ever need. Our favorite, though, is the slightly pricier xDrive35d's turbodiesel engine, which effortlessly launches the 2.5-ton X5 with its 413 lb-ft of torque, and returns a mind-boggling 31 mpg hwy. The xDrive50i's twin-turbo V8 is a real hoot with its 445 eager horses, but if you're put off by this model's price and/or fuel economy, the other two engines are worthy substitutes. On the road, the X5 strikes a sublime balance between comfort and control. The ride is firm, in typical Germanic fashion, but the sophisticated dampers expertly absorb sharp impacts. In corners, the X5's sedan-derived underpinnings deliver excellent handling precision, particularly if the optional active roll-stabilization system is specified. High-speed stability is exemplary, of course, with little road or wind noise to speak of. From the driver's standpoint, crossovers don't get much better than this. Acura MDX -- The MDX's third-row seat is also pretty tight, but you get more for your money overall. Dodge Durango -- The far cheaper Durango is an excellent all-around vehicle with a high-quality interior, a roomy third row and available HEMI V8 power. Porsche Cayenne -- Although it lacks the X5's 3-row versatility, the 2-row Cayenne delivers awesome performance and undeniable Porsche cachet. Used Land Rover Range Rover -- There's nothing like a Range Rover for making a first impression, and you can get a pristine low-mileage example for the price of a new X5. The xDrive35d's combination of dump-truck torque and family-sedan fuel economy makes it an easy choice in our book, as long as you don't mind dealing with greasy pump handles from time to time.